Chemical Right-to-Know, HazMat and Hazardous Waste Labels have never been more important. Every day, over one million people handle hazardous chemicals in their workplaces. Every year, almost 5% of workers suffer chemical exposures that cause temporary symptoms, permanent injury, debilitating illness, or, even, death. To protect workers from such exposures, we offer the web’s largest array of easy-to-understand and complete HazCom labels – all with web-best prices, superior durability and compliant designs. HazCom and HazMat labels are only as good as the training. Here, we offer a range of sign keys, labeling guides and other training materials. Print your own! 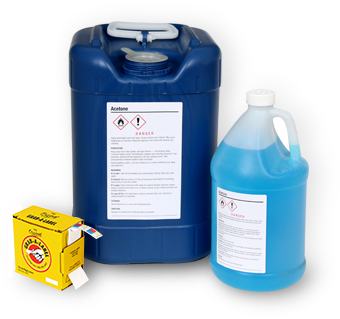 Choose either a predesigned GHS label for the most common chemicals or design your own label online. Download a PDF for free and then print the labels yourself. Label designs are compatible with commonly available Avery label templates. Find 100’s of stock signs and easily customizable templates. Sizes from 5” to 24”. Design your own NFPA label. Our online wizard makes it easy to fill in a template, proof your label and send it to the factory for professional printing. Get your Custom HMIG Label here! It is easier to read, more durable and, surprisingly, quite affordable. • Pre-printed GHS labels make it easy to comply. • GHS picto labels start at $16/roll of 500 –web best. • Avoid the hassles of handwriting your own. • Order as few as 10 custom labels. • Easy to complete and understand. All sizes and designs – including “Circle PPE” labels. • Widest range of NFPA labels online. • Just 2¢ per Label! • Meets IMDG, International Air Transport and ICAO rules. • Labels pop right out. • As low as 2¢ per label! • Popular sizes 2”x3” & 3”x2” available. • Best priced paper & vinyl labels. • Durable drum-grade labels – at the web's best pricing. • Custom labels, too with a 24 label minimum. • Add important chemical info, select name & ratings. • Free PDF printing option. • 130+ preprinted label designs. • Starts as low as 2¢ per label! • Several template designs to pick from. • State specific templates available. • Easy to apply on drums & containers. • Completely customizable to suit requirements. • Many size & material options. • All kinds of labels, tags & signs. • Assured web’s best pricing. • Easy to peel & apply, 100 labels/roll. • Enjoy bulk order discounts. • Available in two types of clips. • Provides handy hazcom guide. • Self-laminating tags at low prices. • Front and back printing. • 3 ring binders in 1.5” & 3” thickness. • Pick a binder or wire rack at low price.